In September 1944, the Allies carried out Operation Market Garden. Operation 'Garden' was carried out on the ground: its objective was to take control of Holland, cutting German access to the country. Operation 'Market' was intended to capture and hold crossings over the canals and rivers from Eindhoven to Arnhem. It was the largest, most ambitious airborne operation ever staged. Nearly 5,000 aircraft were used to drop some 20,000 paratroopers, and nearly 14,000 troops in 2,600 gliders. 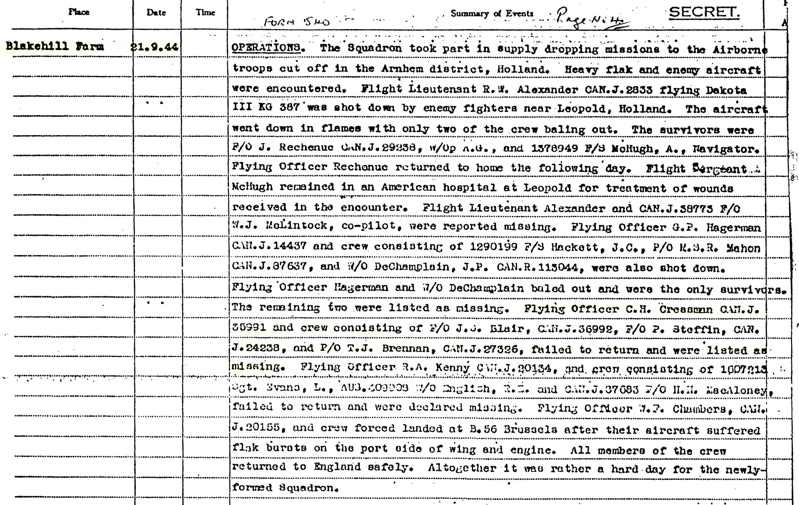 "Today's re-supply serial involved 28 Dakota aircraft ...18 Dakotas of the 233 Squadron and 10 of the 437 Squadron. The latter unit would suffer its first casualties due to enemy action. Carrying 488 panniers, loaded with ammunition, food and medical supplies, the aircraft took off between 1310-1315 hours, led by Wing Commander William Coles of 233 Squadron. Three aircraft of 437 Squadron took off slightly later than the rest, between 1335-1337 hours and two of these 'tail end Charlie's,' flying in the rear of the whole resupply force, would suffer the consequences; they were amongst the nine Dakotas which would not return to base..."
The crash of those two Dakotas was witnessed by George Koskimaki, the radio operator for the 101st Airborne Division's Commanding Officer, General Maxwell D. Taylor, whose headquarters had just moved from Eindhoven to the castle Henkenshage, south of Sint Oedenrode. According to Koskimaki, "On the night of 20 September we moved the Division Command Post up to Sint Oedenrode and on the 21st an aerial resupply was dropped to us by C-47s..and two German fighter planes appeared from the clouds and quickly shot down two of them almost directly overhead. The crews didn't have a chance to bail out." "Regrettably, one of the dead could not be identified and Charles Cressman was buried at Uden War Cemetery as an 'Unknown British Airman.'" For many years, a propeller from KG 489 acted as a local monument. Unfortunately, the propeller was stolen in 2003. "Altogether it was a rather hard day for the newly-formed Squadron." Herb's entry in the Book of Remembrance, in the Peace Tower on Parliament Hill in Ottawa.